The 20 Warmest Years in the Past 22 Years, Really! Twenty hottest years in past 22 years! OMG! 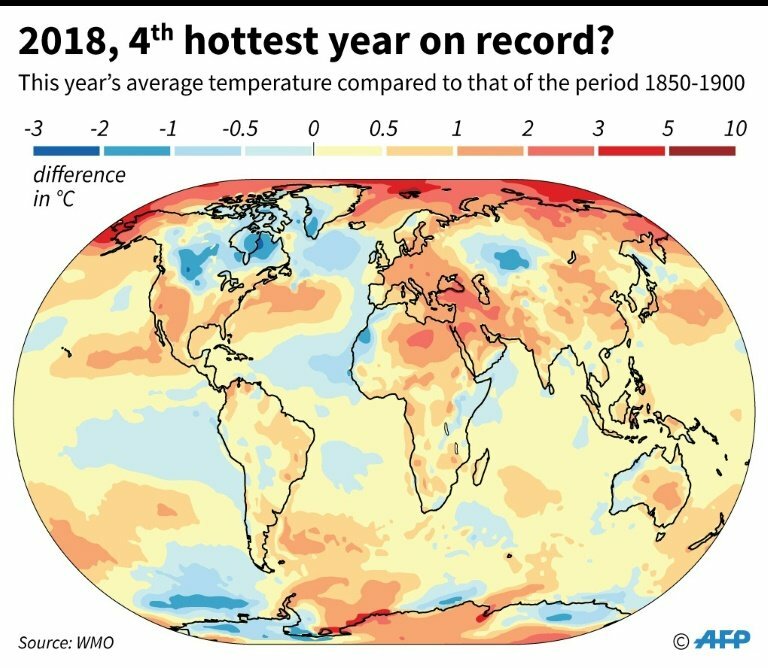 This year 2018 will likely be the fourth hottest year on record, according to the United Nations’ authoritative voice for weather and climate. The three years that were warmer? 2016, 2015 and 2017. The new report, based on five independently maintained global temperature data sets, adds ever more proof that global warming is unequivocal—and we’d better act now to reverse this alarming trend. Unfortunately, the current pace of international government action is “insufficient” to limit warming, the UN Environment Programme warned yesterday in its 2018 Emissions Gap Report. 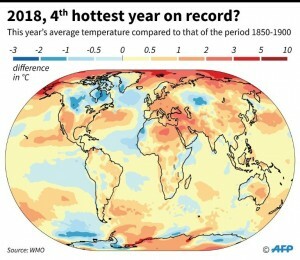 In fact, the annual assessment found that after a three-year decline, heat-trapping greenhouse gas emissions actually increased to “historic levels” of 53.5 billion tonnes in 2017, with no signs of peaking. “It is worth repeating once again that we are the first generation to fully understand climate change and the last generation to be able to do something about it,” he said. Last month’s widely disseminated climate report from the Intergovernmental Panel on Climate Change showed that average global temperatures between 2006-2015 were 0.86°C above the pre-industrial baseline. In the last five years, 2014-2018, it was 1.04°C above the pre-industrial baseline. “These are more than just numbers,” said WMO Deputy Secretary-General Elena Manaenkova in today’s press release. The WMO report comes just days before the critical climate summit COP24 in Katowice, Poland, where delegates from roughly 200 countries will create a “rulebook” on how to implement the 2015 Paris agreement to avoid disastrous climate change. NEW HAVEN, Conn. (AP) — Yale University police have arrested 48 people who were protesting the Ivy League school’s investments in fossil fuel companies and its Puerto Rico debt holdings. The arrests came during a sit-in demonstration Friday inside Yale’s investment office as more than 300 students and community members rallied outside the building. Protesters demanded Yale divest endowment funds from fossil fuel companies because of concerns about climate change. They also said they wanted Yale to cancel its holdings in a fund that holds some of Puerto Rico’s massive debt and is suing the U.S. territory to be paid while the island still struggles to recover from hurricane damage. Yale officials say a school committee has previously addressed concerns about fossil fuel investments and Puerto Rican debt, but that they support student freedom of expression. Climate Scientist: World’s Richest Must Radically Change Lifestyles to Prevent Global Catastrophe | Democracy Now! The 24th United Nations climate summit comes amid growing warnings about the catastrophic danger climate change poses to the world. In October, the U.N. Intergovernmental Panel on Climate Change warned that humanity has only a dozen years to mitigate climate change or face global catastrophe—with severe droughts, floods, sea level rise and extreme heat set to cause mass displacement and poverty. But on Saturday, the United States, Saudi Arabia, Russia and Kuwait blocked language “welcoming” the landmark IPCC climate report. We speak with Kevin Anderson, professor in climate change leadership at Uppsala University’s Centre for Environment and Development Studies, and 15-year-old climate activist Greta Thunberg about the drastic action needed to fight climate change and the impact of President Trump on climate change activism. Indeed, the liberal left does want to reduce carbon dioxide emissions, but so do conservatives. Climate change is an equal opportunity crisis. The liberal left is not pushing for massive migration of those in the Third World to First World countries, simply that we provide refuge for these people when they seek it. It would be far preferable for all to recognize that dire poverty, gang violence and unstable governments are pushing these migrants from their homes, and that the ideal solution would be to address these issues, so they would not feel the need to migrate away from their homes. It’s a red herring argument to pit the needs of the most impoverished and imperiled against the needs of the climate. 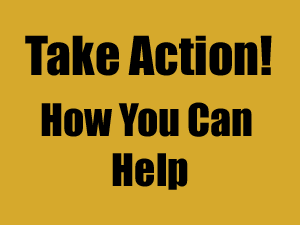 Let’s look for eloquent solutions that solve the problems of both people and the planet, instead of parsing partisan ideas to make oversimplified arguments. Furthermore, if coming to a First World country means your carbon footprint will increase, then it is incumbent on the First World to reduce its carbon footprint.